With the contestants including the likes of the esteemed legends and Alumni of IMT Ghaziabad, the home players of IMT, as well as the ones from premier B-schools like IIMs, SP Jain, MDI, IIFT, JBIMS, IMI, etc, were on their toes throughout the event Adding to the thrill and fervour were the 6,000 odd spectators. As the winter chill reached its peak and temperatures dropped to an all-time low, the undying sporting passion reached an all-time high amongst B-schools all over India as they had only one thing on their mind – ‘Chakravyuh’ – the annual sports festival of IMT Ghaziabad, also known as the Olympics of B-schools. This sporting spectacle, dating back to 20 years, took place in the second week of February, with 25 teams from pioneering B-schools counting themselves as the participants. The competition spanned across eight sports, namely lawn tennis, cricket, basketball, football, table tennis, volleyball, badminton and throwball. Winning an Olympic medal isn’t a piece of cake, and verily so, putting your hands on the ‘Chakravyuh’ trophy too, required a complete blend of strategizing, teamwork and dedication. With the contestants including the likes of the esteemed legends and Alumni of IMT Ghaziabad, the home players of IMT, as well as the ones from premier B-schools like IIMs, SP Jain, MDI, IIFT, JBIMS, IMI, etc., were on their toes throughout the event. Adding to the thrill and fervour were the 6,000 odd spectators. With a constant – unstoppable tussle of 72 hours, the teams put in every bit of strength and expertise they possessed to win the coveted trophy. The magnanimity of ‘Chakravyuh 17’ could be easily seen through the list of its corporate partners. From industry giants like Lotto, Canon and Mahindra Two Wheeler Limited, to premier sporting organisations such as Stag and Decathlon, the list is awe-inspiring. 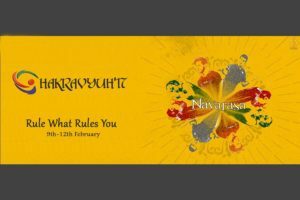 This season, ‘Chakravyuh’ took an unprecedented avatar, and revolved around Navarasa, the emotions of Abhaya (courage), Adbhuta (wonder), Raudra (aggression), Utsarga (devotion) , Vyakulta (anxiety), Ulhas (joy), Karunya (compassion) and Neerava (calm). The extravaganza got a splendid start, with Indian all-rounder Piyush Chawla being the chief guest at the opening ceremony. The ceremony also had performance from Prince Dance Group and a laser show from Dreamworks group. Unheralded scenes were noticed when the laser show portrayed the life at IMT, and more so when IMT’s esteemed director, Dr Atish Chattopadhyay shared the cricket pitch with two-time world cup winner Piyush Chawla. After three days of sporting action, team Aryans from IMT Ghaziabad was declared the winner of ‘Chakravyuh 17’, with another home team, Yoddhas, being awarded the runners up position. Established in 1980, Institute of Management Technology, Ghaziabad (IMTG) [http://www.Imt.Edu ] is India’s premier AACSB accredited management school with a distinct focus on grooming leadership through Innovation, Execution and Social Responsibility. An autonomous, not-for-profit institute, offering highly sought-after postgraduate programmes over the past more than three-and-a-half decades, IMTG currently offers four AICTE approved programmes – Post Graduate Diploma in Management (PGDM) Full Time, PGDM Executive, PGDM Part Time, and PGDM Dual Country Programme (DCP). While the first three programmes are offered at the IMTG campus in Ghaziabad, Delhi NCR, India, the PGDM DCP is offered in collaboration with IMT Dubai campus. The Post Graduate Programme in Management (PGPM) is the latest addition to the list which leads to PGDM Part Time.